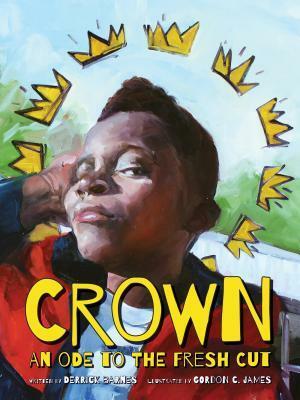 It's called Crown: An Ode to the Fresh Cut and it's written by Derrick Barnes and illustrated by Gordon C. James (published by Agate Bolden, October 2017). Y'all, I have never stepped foot in a barbershop but this book makes me want to find our nearest one and press this book into the barber's hands. And then frame all the spreads and hang them up everywhere. But not our library copy because that needs to be right up front on display where everyone can see it and find it. Buzz has been building for this book and I was thrilled when the publisher offered me a copy for review. I'm not accepting too many review pitches these days, but I snatched this one up. It's got three starred reviews so far and I wouldn't be surprised to see it on many of the 2017 Best lists. So, this is a book that celebrates that feeling of confidence and joy when you get a new haircut. Sounds like something small, right? But it's a big feeling: when you feel like you're looking your best and everyone will notice and you can conquer the world, you can do anything you want to do. Walking through a boy's visit to his local barber shop, the text describes the visit as well as the feelings that go along with it. Ebullient! These gorgeous illustrations celebrate African American boys and men everywhere, something that's much needed in our world. From the crowns on the cover to a boy with his head held high, these paintings communicate that take-on-the-world feeling you get when you have a fresh haircut. It's a small moment, but it's a big feeling and the illustrations express that. And the last spread... how it flips perspective just like a kid who's gotten a fresh cut and now he looks different to the world and the world looks different to him! The text, it bounces right up off the page with energy and enthusiasm. This is a book that begs to be read aloud. It begs to be shared and shared and shared. "You're a star. A brilliant, blazing star. Not the kind that you'll find on a sidewalk in Hollywood. Nope. They're going to have to wear shades when they look up to catch your shine." "It's how your mother looks at you before she calls you beautiful. Flowers are beautiful. Sunrises are beautiful. Being viewed in your mother's eyes as someone that matters - now that's beautiful. And you'll take it. You don't mind at all." And so much more, but I can't quote the whole book for you here - you'll have to go buy it and put it on your shelves and (please) display it prominently. All the world should see that Black boys matter, and they'll see it in this book. Crown: An Ode to the Fresh Cut by Derrick Barnes, illustrated by Gordon C. James. Ages 5-10. Agate Bolden, Oct. 2017. Unpaged. Review copy provided by publisher. My favorite line in the book is, "Tip that man! Tip that man!" Derrick Barnes wrote a shiny gem.